A former high-ranking officer in the Mad Gear gang, Rolento is an expert in hand-to-hand combat. Now he foucses on creating an "ideal nation" where everyone is a soldier day in and out. Oh, Mad Gear! That means Rolento is another Final Fight character! He was the Stage 4 boss in the arcade version of the game, but that level was cut from the console version for space reasons. He's so obscure, I thought he was DOA's Bayman. I mean, orange clothes, red beret... it's an easy mistake to make. The beret is new, and so is the clever little piece that creates his collar and the harness of grenades strapped to his chest. He's also got a new waist cap to make the lower edge of his shirt, and is armed with his green baton. Kuma, a ferocious bear, uses a variation of the Heihachi Mishima style of karate. He is a partner to Heihachi and has also sat on the Mishma Financial Group's board of directors. Are you kidding? The jaguar guy isn't a jaguar guy, but the bear is a bear? And they still never made the kangaroo? For cryin' out loud! Making a bear out of a standard Minimate body requires a lot of new pieces: boots, thighs, gloves, upper arms, a huge chest cap and a head. If you want him to be a plain bear instead of a fighting bear, the red scarf he wears around his neck is a removable piece. The face doesn't look very much like a bear, honestly, but every one of his new pieces is sculpted with a furry texture. 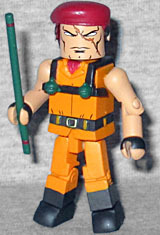 Of all the Street Fighter x Tekken Minimates available at Toys Я Us, this set was hands down the hardest to find - and it wasn't because it included Rolento. 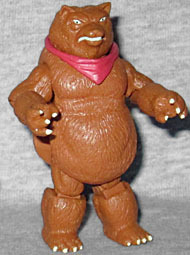 There's just something everybody seemed to love about a Minimate bear, so he was consistently the first to sell out.